Its not everyday I get invited to a Tea Party! And not only that, one hosted by Ms. Dita Sandico Ong herself. Fashion with a cup of Tea.. An intriguing combination difficult to resist! So when Jen asked me to go with her to the event last February 1, I immediately jumped at the chance despite the shocking fact that its NOT about Coffee but about TEA (haha.. the coffeeholic side of me cannot believe I just did this!). As a coffee lover, I must admit that drinking Tea was difficult in the beginning. I kept on comparing it to coffee which you really shouldn't do. Trust me, I ended up eating every single negative word about Tea coz well.. I got hooked! LOL. It took a lot of convincing but Tea did ended up romancing me over to its side (naks chos.. ganun kalakas ang tama sa coffee sensibilities ko! hahaha!). This must also have been the case for Ms. Dita Sandico Ong. Tea that touches us on a "soulful level" has brought this talented fashion designer to share a different kind of art -- the art of drinking tea. The Tea Party was held at the DSO Boutique in San Juan, Greenhills. It was my first time to see her fashionable craftsmanship and I'm just simply amazed by her pieces. As far as I know, what makes Dita Sandico Ong unique is due to the special hand-woven cloth that was made by weavers in Catanduanes and the innovative designs that is well-loved by women all over the world. Here are some samples of her amazing work that would make any Filipino or Filipina PROUD! One of my favorite picks that were displayed in the boutique! And yes, partly because its violet! lol. Love this! The eye catching colors really stand out. I like the top of the one in the middle! Besides the wraps, she also makes adorable and elegant accessories to match her creations! So during the tea party, the first thing that we did was to sit back, relax, and take a sip of Tea, her new line of floral tea leaves which is the designer's advocacy for educating the youth on healthy living. Miss Dita went on to explain that she would like more Filipinos to take pleasure in drinking tea. I think I can say that drinking coffee is more natural for Filipinos than drinking tea (haller! agree ba agree?). So it was fitting that she even took the time to explain to us the art of drinking and appreciating tea. Haha I needed that! Well after all having tea as an alternative is just a recent trend here in our country. Her experience of tea drinking abroad has inspired and encouraged her to take this practice here at home and hopefully make it a healthy lifestyle choice for many of us here. Real dried flowers in the tea! I was delighted that I could actually taste for myself this wonderful aromatic teas for myself. They let us choose which flavor we wanted to try out and they prepared it right in front of us. Preparing tea is not as difficult as it may seem. And how you want your tea done - whether strong or light is dependent on how you prepare it yourself. Anyway, I'm glad someone else did it for me during this time coz I really wanted to enjoy drinking it and I was kinda afraid that if left to my own devices, I might just mess it up. Step 2 - Pour water in tea pot and let the leaves settle. The temperature of the water is dependent on what kind of tea you are brewing. For more info on this click here. Step 3 - Pour tea to cup. Number of minutes before pouring is dependent on the type of tea that was brewed. Use a tea strainer so that your cup of tea won't have loose leaves floating about. Step 4 - Add sugar to taste! Or for some, don't add sugar at all! Step 5 - Now this step is totally optional. But if you are a MILK TEA FAN (like me!) , this would definitely work for you! Pour milk to your tea. Yum yum. This particular concoction worked for the "Rejuvenating Blend" by DSO. Please do read on if you want to find out what I meant exactly. Inspired by the film and fashion icon of the 20th Centur, this unique blend of Jasmine, Green Tea, Cinnamon, and Michelia Champaca is designed to uplift one's spirit. With the delightful flavor and aroma, this blend is recommended for anyone who wishes to live blissfully and stay young at heart. I personally liked this tea. 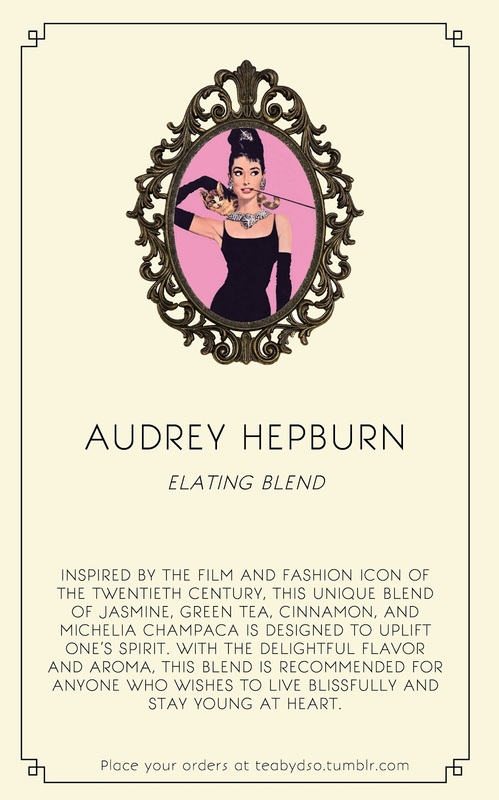 Did the Audrey Hepburn design swayed my choice? Yeah definitely! Audrey Hepburn is one fashion icon that really left an indelible mark on me when I was young. Sipping the tea, I could just imagine myself drinking this while having "Breakfast at Tiffany's". Hehe. It did have a strong floral scent but it wasn't overpowering. You can definitely sense the Jasmine in it but I didn't find it overwhelming (unlike some other floral teas that I've tasted) and I did enjoy it. Inspired by the Argentinian actress turned first lady, this unique blend of Oolong Black Tea, Orange, and Lavender is designed to rejuvenate the senses. Fondly called as Evita, the spiritual leader of the nation, she was able to enliven the people to take action. Much like how these powerful flavors can energize anyone who aspires to take on the world. Try it with MILK and enjoy a superb chai tea blend. Now this was my personal favorite! 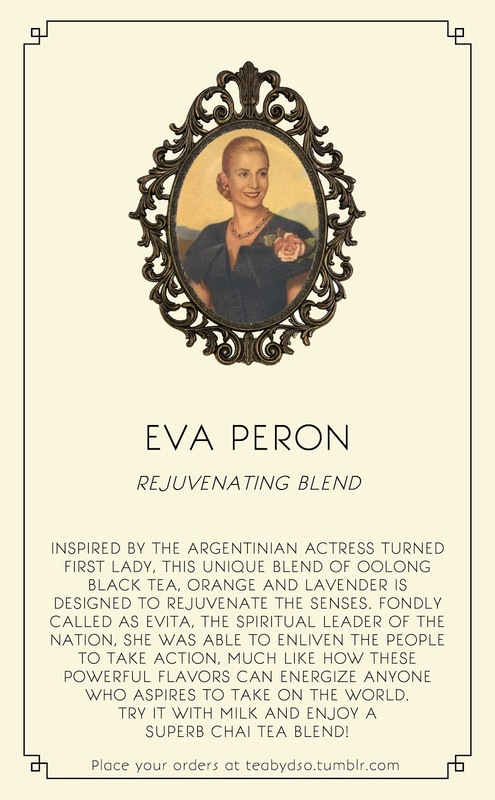 Yes, the Eva Peron Rejuvenating Blend TEA by DSO was the one being demo'd in the "How to Brew Your Own Pot of Tea" above. I absolutely loved the flavor of this especially since it did give off a "chai tea" taste to it. So if you are a Milk Tea Lover like me, this would be your best bet! 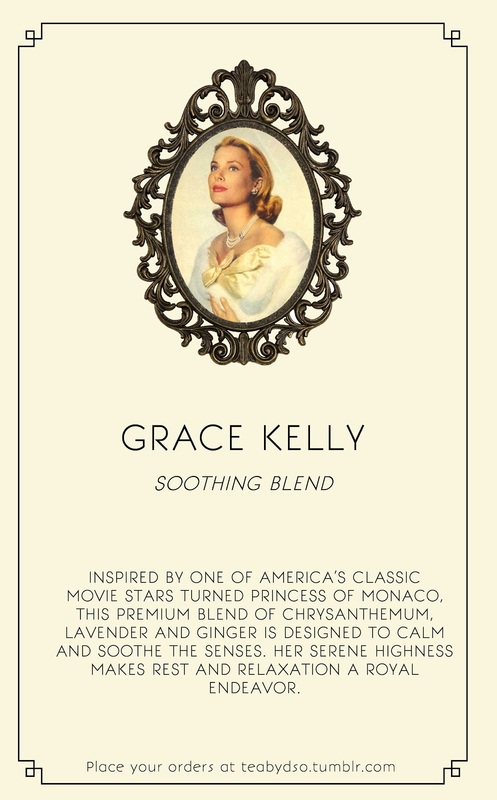 Inspired by one of America's classic movie star turned Princess of Monaco. This premium blend of Chrysanthemum, lavender, and ginger is designed to calm and soothe the senses. Her serene highness makes rest and relaxation a royal endeavor. For me, this was a pretty mild tea but you could immediately distinguish the floral scent of it. I saw the actual Chrysanthemum dried flowers and am amazed that I'm actually drinking flowers and liking it! Yes, it is soothing and I think this would be perfect if you want to de-stress and relax. Perfect drink just before you sleep kind of tea. 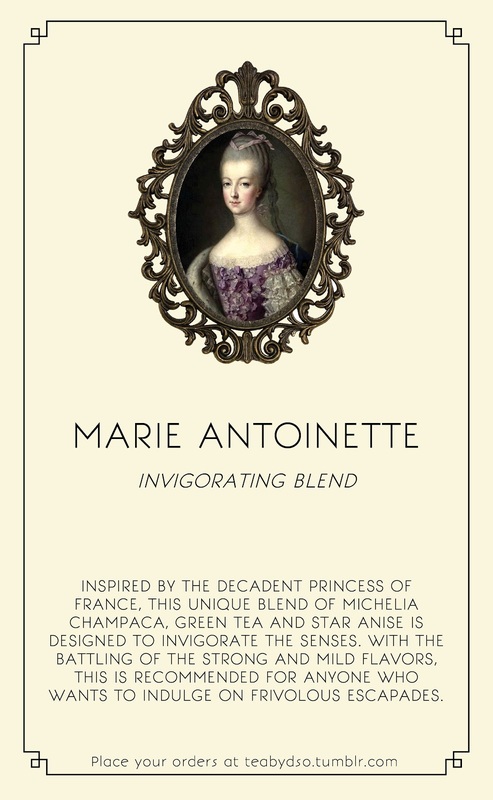 Inspired by the decadent princess of France, this unique blend of michelia champaca, green tea, and star anise is designed to invigorate the senses with the battling of the strong and mild flavors. This is recommended for anyone who wants to indulge on frivolous escapades. I'm afraid this is one tea that I cannot make a lot of comment on. I wasn't able to fully taste this one and only had a sip from either Jen or Bec. I only smelled the leaves and the scent that I remembered was the star anise! Inspired by the eccentric Mexican painter, this premium and unique blend of Jasmine, cloves, star anise, cardamom and rose is designed to exhilarate and enliven the senses. 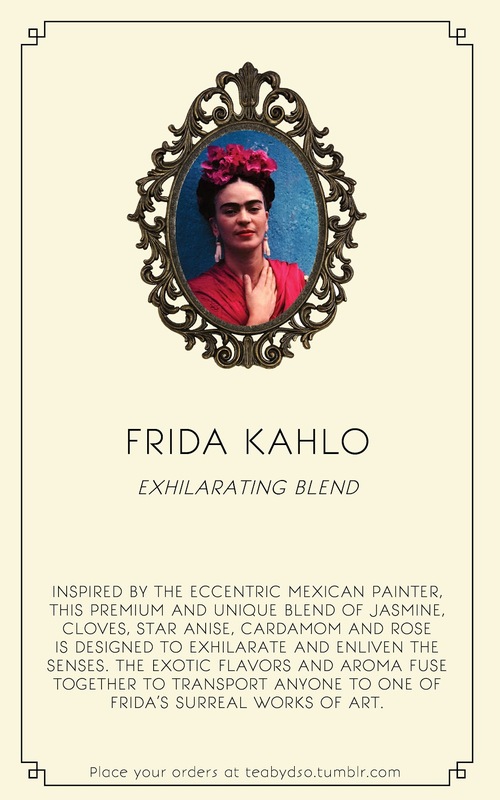 The exotic flavors and aroma fuse together to transport anyone to one of Frida's surreal works of art. I remember this tea as one of the teas with the strongest scents and blends. I can't say I'm a big fan but I know some of the other bloggers liked it (hehe.. again I'm partial to milk tea so please forgive me.. lol). The night ended with a mini fashion show that kicked off DSO's Leapin' Dragon season. The bright oranges and deep purples of her spring/summer collection, the fragrances of floral tea leaves, the stories of the women behind each blend, and the invigorating power of Tea all inspire and stir the depths of your soul. The following outfits were inspired by these women and the TEA designed by Miss DSO herself. Thank you so much for inviting us to the Tea Party! I learned a lot that day. A Tea won't be a TEA PARTY without FRIENDS! Thanks Jen for inviting me along. with BEC the makeup guru! With REG the Hey Rocket Girl! Tea is now available in the DSO Boutique on Wilson Ave., Greenhills, San Juan at P250 special introductory price. You may also place your orders at teabydso.tumblr.com or text +63917 579 0809 / +63915 189 1279. So Coffeeholics, do indulge yourself to a cup of TEA every once and a while and avail its beneficial medicinal or herbal benefits it has in store for you. CHOOSE to have a healthy, chic, and cultured lifestyle this 2012!